Though I have been fascinated with cars as long as I can remember, my toddler years were not conducive to the early development of automotive enthusiasm. My father drove cataclysmically woeful malaise-era family sedans, and though I still was interested in how they worked and what it was like to drive them, I didn’t know the wonders that were eluding me. But when I was 7 years old, my mother took me with her as she test drove a car she was looking to buy for herself. This car was not like any other car I had encountered before. It had a lever on the floor, and she was moving it around almost constantly, and every time she did, she pushed in a third pedal and then released it. She was doing a whole lot more work than she was when she was driving my father’s car, but the car was reacting to every single movement she was making. She was in total control of the car. I was riveted at the whole concept of what she was doing, but the smile on her face said it all. It’s an impression that has stayed with me ever since. The car she drove, and eventually purchased, was a used maroon 1984 Ford Mustang 2.3L 4cyl with what I soon learned was a manual transmission. Fast forward to my test car, and the basics are strangely similar to my mother’s car. It was a Ford Mustang, also in a red variation called Race Red, and it too had a 2.3L 4cyl engine, and it had a proper manual transmission with three pedals as well. But those are where the similarities end. While the 2.3L 4cyl in her car was carbureted and naturally aspirated and produced a stingy 88hp and 122 ft-lbs of torque, the 2.3L 4cyl in my tester was direct injected, turbocharged and intercooled, and made a much more impressive 310hp and 320 ft-lbs of torque. Hers had a 4-speed gearbox, while my tester had a 6-speed. Hers, a curb weight of 2689lbs. My tester, nearly a half-ton heavier at 3511lbs. Would 25 years of automotive technological progress and onslaught on my memory allow me to have that same eye-opening moment I had at 7 years old when my mother showed me just how much fun driving a car could be? Before I start waxing poetic, let’s address the main concern. Though 7-year-old me may have been enthralled at how much different a car with a manual sounds compared to an automatic, I realize as an adult the Fox-body Mustang 4cyl engine sound is pretty terrible, and the improvement of the sound of the EcoBoost engine is slight. It’s no secret at this point that the stereo pumps artificial noise through the speakers to enhance the sound of the engine, and while it helps, those who insist on the storied V8 rumble while the Mustang symbol is on the steering wheel in front of them will never find the EcoBoost’s voice to their liking. Furthermore, it’s been 30 years since Mustang owners have heard the hissing sound of a turbo coming from their engine, so them finding it peculiar now is no surprise. Also, that 30-year-old turbo Mustang, the SVO, was making as much (and at one point, more) horsepower than its 5.0 Windsor V8 counterpart. 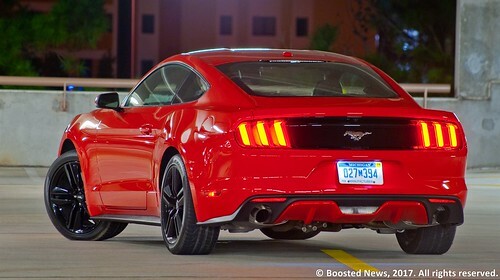 That is not the case with the Mustang EcoBoost, since the 5.0 Coyote V8 now makes 435hp in the Mustang GT. The EcoBoost manual is still decently quick with a 0-60mph time of 6 seconds flat and a quarter mile time of 14.3 seconds at 98mph. But the citizens of the Internet and even many automotive media outlets want you to think you’re settling for less with the Mustang EcoBoost. You’re not, if you check the options box wisely. My particular Mustang EcoBoost test vehicle was equipped with the Performance Package, which makes several very crucial improvements. More attractive black 19-inch wheels with summer tires surround larger front brakes with 4-piston calipers, the front springs and rear swaybar are heavier duty, there are oil pressure and turbo boost gauges in the dashboard, and the rear differential is upgraded to a limited-slip unit with a taller 3.55:1 ratio. 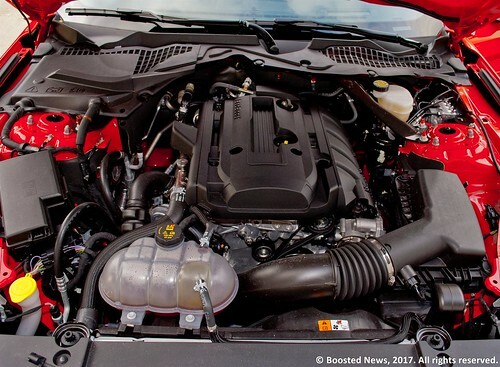 This package successfully separates the Mustang EcoBoost from the secretary’s car mindset, instilling it instead with a heady amount of roadholding ability on a curvy two-lane rural road or even on a racetrack. The aforementioned curb weight of 3511lbs means it can’t pirouette like a Miata or 86/BRZ, but the Pirelli P Zeros hold on hard enough to generate 0.91g of lateral acceleration, and after all those decades with a solid axle, the Mustang finally has the ability to take a corner like a car built in the 21st century should with a fully independent rear suspension. Furthermore, the EcoBoost loses almost 200lbs of curb weight to the GT, virtually all of it in the front. In fact, the weight distribution of 52% front and 48% rear is the closest the Mustang has ever come to the perfect 50/50 in its 50-year history. It’s actually balanced, and the weight means it’s at least more predictable if you find yourself past the limits of the P Zeros. It should be said that the Mustang’s interior is not what you’d call an exercise in munificence. Plastic is still clearly the material of choice. The shifter is in just the right place, the pedals are ideally spaced apart for heel-and-toe shifting, and the controls in the center stack fall easily to hand, from the A/C controls to the switches that turn the traction control off or change the engine from Normal mode to Track mode, but there’s no artistry to it, except for the plaque in front of the passenger that says “Mustang: Since 1964.” The Mustang’s interior has just what you need and nothing you don’t, and I can appreciate that. Previous Mustang interiors (the SN95 Mustang of the 90s springs immediately to mind) tried to add some pizazz, but fell far short of the mark. Those swooping curves in the dash were at the expense of usability (putting the shifter in a really awkward position, for example) and the chintziness of the materials undid the aesthetic of the design and then some. The Mustang now has an interior that’s good enough, and that’s all it needs to have. Besides, the artistry was saved exclusively for the outside. I like the look of the current model more than any other generation. It gives all the nods it needs to give to the name’s heritage, while making it crystal clear that the Mustang is going to be a part of the future and not the past. Every single body line gives the exact visual effect it was designed to give, and it’s the first Mustang in a long time that gives its owner style and presence no matter which model is chosen. Mustangs of the past punished the owner for buying the base model; when she first got it, my mother’s 1984 Mustang had whitewalls and wheel covers that looked like they belonged on a Mercury Grand Marquis, and it was nothing short of depressing. But not anymore. The Mustang EcoBoost, especially with the Performance Pack, looks just as attractive as the Mustang GT. So, did my Mustang EcoBoost tester recreate that awakening of my early childhood? Absolutely, in every single way. Even though I should have been at home doing laundry or balancing my bank statement, I was out at night driving the Mustang around the entire week I had it. Oftentimes I would downshift a gear and stab the throttle to feel the turbocharged pull that I’ve longed to feel in a Mustang for many, many years, and that probably explains why my observed fuel economy was 19mpg even though the EPA rates the EcoBoost manual at 22mpg in city driving. At one point on the weekend, I had an early night and an early morning, earlier than the sunrise, and I just drove around aimlessly, without the interference of Central Florida traffic, getting the minutiae of life out of my head. I remembered how much my mother loved driving her Mustang, and how irrelevant it was to her that it wasn’t the tire-chewing 5.0. It was hers, and it was something in her life that she had control of, because it was a manual transmission, yes, but also in the abstract sense that she insisted on enjoying the car she drove. 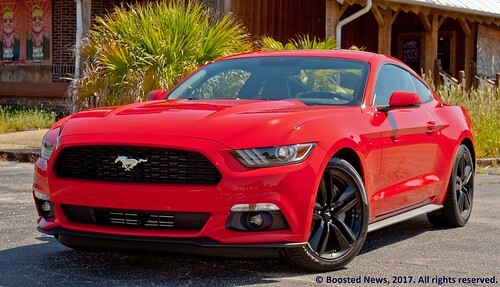 The Mustang EcoBoost gave me that feeling back so completely that I am considering one for myself. 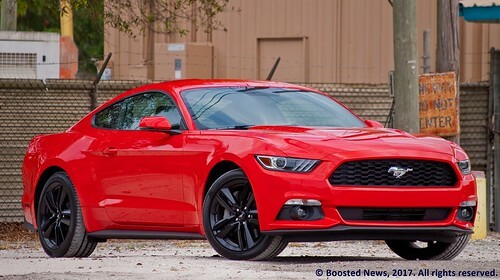 I will likely be in the market for a new car in the next year or so, and a Mustang EcoBoost with a six-speed manual and the Performance Pack is hovering right at the top of the list of the cars I’m thinking about buying. 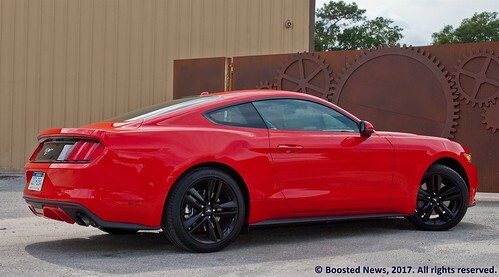 If that comes to fruition, typical Mustang owners will no doubt wonder why I chose an EcoBoost with a Performance Pack when a base model GT 5.0 can be attained at the same MSRP, and will likely question my dedication to the creed of Mustang ownership. While the Mustang GT is most decidedly a muscle car, I see the Mustang EcoBoost as a sports car, a classification I would have never given a car with the galloping horse logo until now. It’s a 310hp, turbocharged, rear wheel drive, two door car with an independent rear suspension and seductive looks. It’s a sports car. But more importantly, the Mustang EcoBoost evokes a memory and an emotion I haven’t recalled in a quarter of a century.